Crawling through the murky tunnels of the Russian metro system never ceases to terrify. Growls and footsteps echo through the deafening silence as darkness enshrouds the area, keeping you on constant guard. Monsters lurk all over, always stalking you extensively before striking. A flashlight and lighter are your only means of illuminating the shadows, their paltry shine a small comfort against the horrors that prowl. Based off the series of novels by Dmitry Glukhovsky, Metro: Last Light from 4A Games depicts a post-apocalyptic Russia after its citizenry was forced underground following a devastating nuclear war. Society barely holds itself together, factions fighting over what scraps remain in the metro, whilst mutants run wild on the uninhabitable surface and through abandoned halls. It’s a treacherous world out there, but a fascinating one to explore. 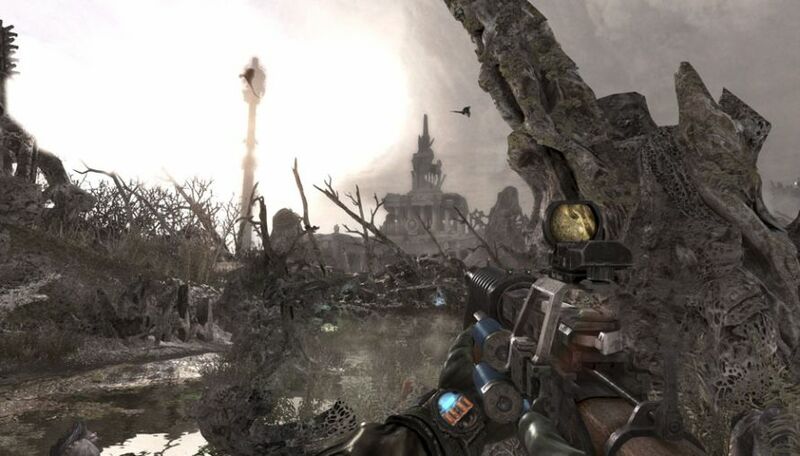 Metro: Last Light follows Artyom, a soldier of a group known as The Order, on a mission to eliminate the last of the Dark Ones; a sentient race thought to be eradicated after their perceived threat to mankind. Along the way, he uncovers plot that threatens to destroy The Order, and quite possibly plunge the entire metro into another war. It’s a surprisingly emotional tale; not uplifting by any stretch, but very contemplative, deftly dealing in philosophical and even spiritual matters often. The ruins of Moscow manage to be breathtaking. Last Light picks up one year after Metro 2033, the once icy climate having given way to marshy lakes, the metro’s governing factions working toward signing a peace treaty. Much of the story references the events of the last game. Though the opening cinematic imparts the important stuff, it’s easy to be lost for a while if you aren’t already familiar with the set-up, as background on the world and its inhabitants is mostly left unsaid. Even so, it feels realized. The environment exudes history. Both the metro and the irradiated surface speak volumes about dreadful state of the Earth. Improvised slums lined with makeshift houses exhibit a never-ending life of poverty. The barren outside world displays desolate, abandoned land; buildings left to rot, crumbled roads, crashed airplanes, and swamps galore dot the scenery. It’s a disheartening sight; an eerie beauty permeating the area. Metro eschews conventional cutscenes, opting for non-intrusive delivery via conversations with key figures and eavesdropping on locals’ gossip and chatter. Smart, as the drab environment demands exploration, which wouldn’t be otherwise possible through traditional cutscenes. Artyom narrates between chapters and provides additional background through journal entries hidden through each chapter, both granting a peak at the silent protagonist’s motivations and character. Though some of that detail is lost due to how well journal pages conceal themselves. Although your choice of approach can fill in those blanks nicely. There’s a minor moral element to play, affecting occasional pieces of dialog and awarding achievements for performing perfect stealth runs. Last Light keeps the purpose of the system unknown, however, ensuring play isn’t bottlenecked into a pure stealth run from the get-go. Despite being a first-person shooter (and the shooting being swell), Metro actively encourages stealth. Resources are limited; every bullet spent is one that could very well be the difference between life and death against mutants. You’re suggested to take the silent approach whenever possible, which is as easy as sticking to the dark. Guards’ sight only goes as far as their helmet-mounted flashlights shine, allowing for fast and nimble traversal. 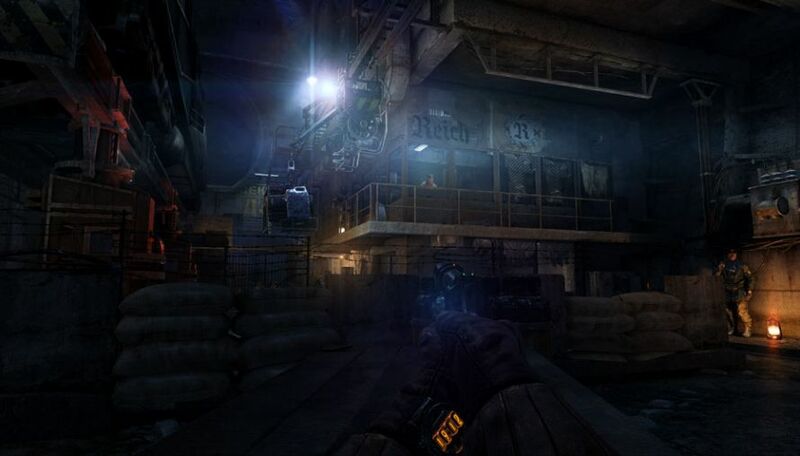 Smart audio and visual cues allow you to instantly know whether you’re no longer hidden, a blue light on Artyom’s watch indicates whether he’s visible to enemy eyes, while a sudden harsh note of music signals you’ve been seen. Avoiding conflict is often your best option, but it’s hardly easy in situations like this. Environmental light-fixtures can be either shot out or switched off manually, both warranting investigation from adversaries. Once they’ve entered an alert state, however, they remain in that state until you’re found, knowing better than to return to set patrol patterns. They move cautiously, scanning the area thoroughly, even attempting to flank you based on your last known location. Getting around them in such a state proves difficult. The occasional hidden path grant some breathing room, but they only get you so far. You’ll still have to contend with the soldiers at some point, whether that be through continued subterfuge or all-out war. Supplies may be scarce in Metro, but never so much as to put you at a constant disadvantage in firefights. An assortment of assault rifles and shotguns are available, each able to be customized to increase range and accuracy. Revolvers can be turned into rifles, silencers attached to shotguns, assault rifles into snipers, and so on. The options provide plenty of diversity in your choice of tactics. Vendors located in safe-zones sell these modifications in addition to ammo. Military-grade bullets serve as currency. Their rarity makes them an exponentially valuable commodity, as well as an extra powerful stock of ammunition to draw upon if you’re desperate. Humans serve as simple opponents. They employ rudimentary tactics – staying behind cover, moving in groups, etc. – making them easily dispatched with a few well-placed shots. The danger in contending with them comes through sheer numbers. Hails of gunfire make quick work of you in seconds, enemy soldiers operating in perfect concert. Running-and-gunning is tough against human foes, for every hit you take causes your aim to waver, which quickly becomes futile when you’re taking fire from all sides. Have to be methodical to triumph in any impromptu gunfight. Mutants are where the tactical approach is thrown out the window. Expeditions to the surface always escalate to combat almost instantly. Within minutes, monsters emerge from all sides, their grotesque form overtaking you. The wildlife is relentless, never letting up on their assault, blood and dirt staining your gas mask as cracks form with every strike. Visibility is as much an adversary as the creatures. You must keep the gas mask on at all times outside because of the extreme radiation, replacing filters periodically lest you wish to suffocate. Cracks and smudges cloud the view, a problem compounded by the greyscale color scheme of critical condition. Frightening as they are, these spiders are the least of your worries when traversing the underground. Mutants attack mercilessly, never backing down once they’ve caught your scent. Their tactics vary based on the type – some employ hit-and-run maneuvers such as the rat-like “watchmen,” whilst spider-scorpion hybrids close in from the shadows and unleash an endless flurry of strikes until illuminated – but the basic strategy of shotgun blasting them works for most. The game even explicitly mentions that shotguns are most effective against mutants. But it’s not as easy as it sounds because they stay on the move constantly and are especially resilient. Monsters shrug off shots easily, pressing onward seemingly unscathed. They certainly react – grunts and flinches affirming successful hits – but not so much as to break stride. Occasional boss-mutants border on bullet-sponge territory, absorbing shots ruthlessly with little to no feedback. They’re long, draining encounters, eating away at resources hastily between the boss itself and reinforcements. Thrilling to partake in on paper, but formulaic and protracted in practice. Each boils down to circle-strafing around them, sustaining the occasional blow, whilst pelting them with bullets until they retreat. That sums up every other encounter, sure, but the difference lies in the odds. Duels simply aren’t interesting. They take the brilliant foundation of regular combat and gut the intense, claustrophobic nature. 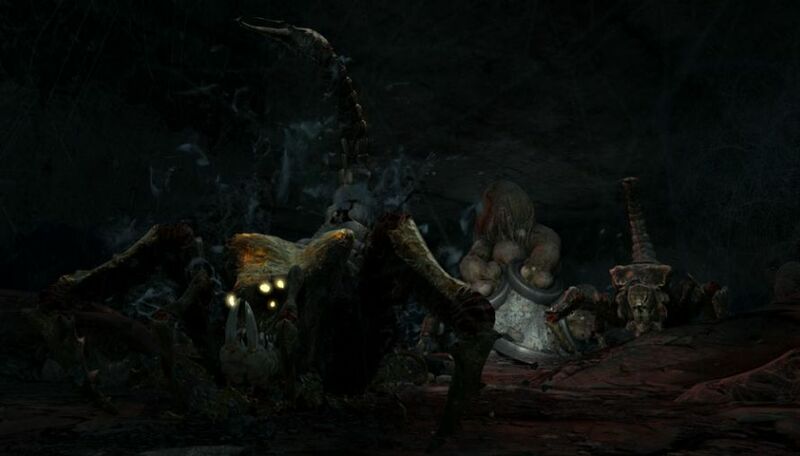 Groups of enemies are frightening to contend with because they always swarm you. Even in spacious arenas you’re forced to scramble, trying desperately to land shots on agile foes that can destroy you in a single, concerted attack. The stakes are high because the odds are rarely in your favor. In one-on-one, the odds are precisely in your favor, a lone mutant far easier to slay due to the ease of focus. None of the panic sets in. Every shot can effortlessly be calculated and executed, a greater room for error removing any concern for wasted ammo. It flies in the face of what Metro does best: balancing survival horror and action. The atmosphere keeps the balance in order, but only just. Both the environment and weather bring style to the drawn-out boss encounters. A dark cavernous room serves as the arena for a showdown against a large rhinoceros-like foe, threatening to cave the enclosure in with each rock-pillar it demolishes. Marshy, moonlight bathed clearings provide poor traction whilst contending with an overgrown watchman, flashes of lightning and torrents of rain creating a climactic scene. For such a drab game, Last Light constantly astounds, visually. Metro: Last Light does everything right. Its stirring, poignant tale and fascinating world construct a brilliant setting; grim and depressing, but almost hopeful, too. It plays well, too – a relentless sense of terror pervades every second, every battle and infiltration thick with tension. It’s an astounding game all-round, and one of the year’s finest as well.